Budding flowers, leaves and the first sign of thaw all mean Spring is here. You can get your kids involved in the changing of the season by showing them some fun hands-on activities. 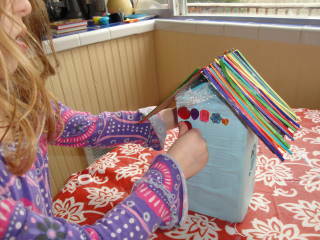 Teach them about birds then make a craft that correlates. 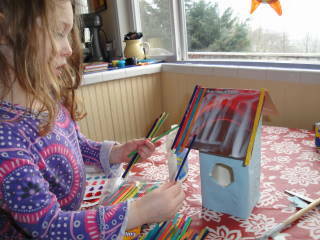 Go out and birdwatch, then come inside and make a bird house or a bird feeder for them. 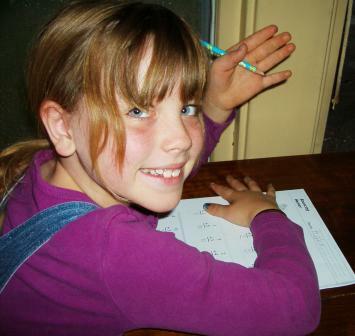 The supplies are minimal and can typically be found around your house. This is done easily and can be started by a nice nature walk. Take your child out and search for the perfect pine cone. Then spread peanut butter all around it (creamy works best). Finally, roll the peanut-butter covered pine cone in birdseed. Tie a string to the top and hang it from a tree or in front of a window. You can have fun watching the different sorts of birds come by to eat. Bonus: Have your child try to find out which bird she spotted. You'll need to help her if she's young. Do an internet search to find which birds are local to your area. I love the website Birding Guide. This is a very easy bird feeding device that recycles your old 2-liter soda bottle. Take a 2-liter bottle. Strip the label off and rinse it out well. Then, using your very sharp knife, cut a circle out of the side, about ¼ way up from the bottom. Then, either drill a hole, or poke a hole underneath the cutout and stick a dowel or chopstick through the 2-liter bottle. This will be used by the birds as a ledge to reach the seed. Then fill up the bottle, to the cut out. Place the lid on the bottle and hang it using string or floral wire. 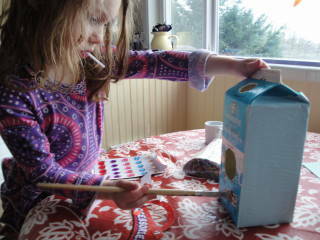 This takes a lot of mommy/daddy help, but the amount of bird seed you can supply makes for a fun bird-watching theater. 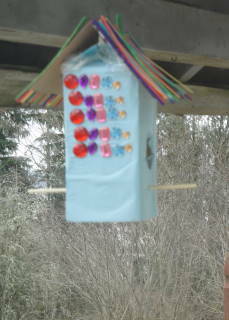 This can be an indoor craft, with paint and stick on jewels, or you can make it appropriate to actually house a bird. Take a half-gallon milk cart. Rinse it out. Then cut out a hole ¼ way up from the bottom to use as the door. 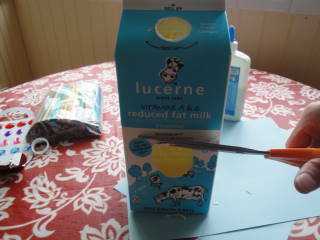 We also wrapped our milk carton with construction paper so it could be any color we wanted. If you have an annoying plastic lid at the top to keep milk fresh, cut that out and line the top with saran wrap. 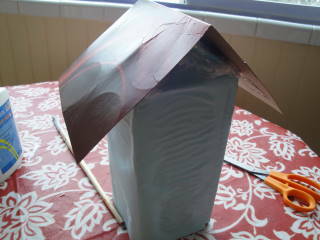 Then take a soda box, or a similar cardboard and cover the top so you'll have a nice even surface to make a pretty roof. (Use something waterproof if this will be out in the rain). Then, spread glue along the top and lay out your roofing material. 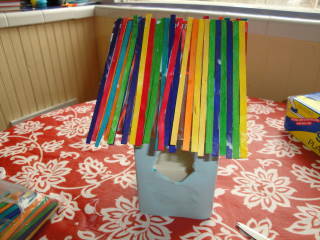 This can either be popsicle sticks, or we used a colorful bunch of wood sticks we got for a buck at the dollar store. Decorate the outside with bling and string the top. Stick a chopstick through the bottom for a ledge, and you have an adorable birdhouse. You can throw seed in the bottom of the inside to attract birds, or just hang it up in your child's room. We liked ours so much, we took it down from the deck and hung it in the living room. It looks like a shimmery Jamaican beach hut, and we could use sparkle in our rainy spring, so it's staying. Hopefully these crafts will get your explorer more interested in the world around her. It sure beats watching a special on the Discovery channel. Learn how you can manage your child's crafts they bring home from school without getting clutter crazy.